Mark Sullivan has dedicated more than 25 years of his life to the United States Secret Service, and he knows the agency, its mission and history inside out. He has handled numerous assignments during his career, including the Presidential Protection detail. He even helped to protect a young Chelsea Clinton when she was enrolled at Sidwell Friends School in Washington, DC – the same school that President Obama’s daughters, Sasha and Malia, now attend. 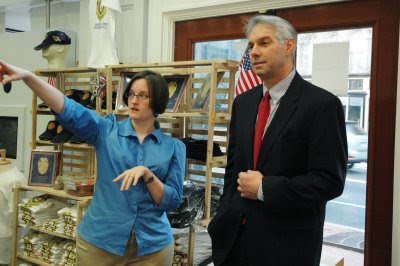 On Monday morning, Mr. Sullivan, who now serves as Director of the Secret Service, stopped by the NLEOMF’s Visitors Center & Store to take a look at a special “Protecting the President” exhibit that has been on display for the past two months. The exhibit chronicles the history of the Secret Service, explains its role and the role of local law enforcement in protecting the President, and showcases some of the “tools of the trade” that special agents and other law enforcement officers use in this critical work. It also honors the 17 law enforcement officers—federal, state and local—who have died in the line of duty while protecting the President throughout U.S. history. The exhibit was put together by the NLEOMF’s Museum Programs team, led by Laurie Baty and including Jenifer Ashton, Betsy Bowers, Kim Hanser and Vanya Scott. They were assisted by Mike Sampson, archivist for the Secret Service; Sgt. Nick Breul, who serves as historian for the Metropolitan Police Department of Washington, DC; and Eshanthi Ranasinghe, of the NLEOMF Communications staff. Director Sullivan expressed appreciation for the exhibit, its attention to detail and its role in educating the public—in particular, the thousands of people who visited and walked by 7th and D Streets, NW, during Inauguration weekend—about the work of the Secret Service and its partners. Director Sullivan even apologized for not getting to the exhibit earlier, but explained that he was “a little busy” with the Inauguration—the largest and most scrutinized in history. 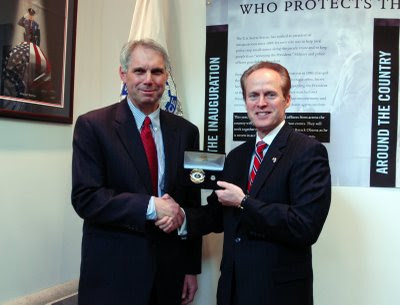 Craig Floyd, NLEOMF Chairman and CEO, presented Director Sullivan with a special commemorative badge the Memorial Fund created to honor law enforcement’s role in the Inauguration. (The badges are numbered, and Director Sullivan received one of the low “single-digit” badges. Mr. Floyd explained that Badges #1 and #2 were reserved for the men whose names appear on them: the President and Vice President.) Director Sullivan returned the favor, presenting special Secret Service Inaugural coins to NLEOMF staff. If you haven’t had a chance to visit the “Protecting the President” exhibit, you had better do so quickly. It is coming down this week to make room for new displays leading up to National Police Week. The Visitors Center & Store is located at 400 7th Street, NW, Washington, DC. You can always view the exhibit content online on the NLEOMF website. I wanted to share some news with you about a new timeline for the National Law Enforcement Museum project and some cost-saving measures that our Board of Directors approved last week. The building will be reduced in size, but the new plan retains two-thirds of the exhibit space, a theater, a Museum shop and dedicated areas for education and research. Please be assured that we are also committed to honoring all of the recognition opportunities that have already been secured by you and our other generous donors. These changes will allow us to build the first-ever National Law Enforcement Museum sooner, rather than later. I want to thank all of our supporters for your continued patience, understanding and support during these very difficult economic times. The story of law enforcement's extraordinary contributions to our nation needs and deserves to be told. We are going to make it happen.